There's nothing better than arriving in Ireland than to be greeted by a fellow angler who lives in the area you are about to fish. My name is Dave Price and I would be delighted to be your guide! I originate from the UK and moved to Southern Ireland 16 years ago. Several years ago, I decided to set up an angling guide service called Fish Tracker. I am situated in Co. Leitrim and cover an extensive area around the Midlands. I have become somewhat of an expert on where to fish and especially the species to target. Discover the secret loughs, lakes, rivers across lovely Leitrim, Roscommon, Longford and Cavan. Our local knowledge and valued angling skills can guide you on your Irish Fishing Trip of a Lifetime. We cater for all size groups, and no matter what your target species i.e. 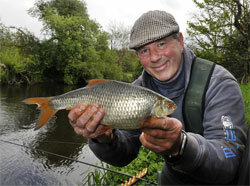 Bream, Tench, Hybrids, Roach, Pike or Trout our guides will look after your needs. The guides can take you to some secluded and special places that will be cleared of weed if required and pre baited prior to your arrival. Interestingly there are a lot of anglers coming over to Ireland fishing who prefer travelling by boat to fish from the shoreline of a tranquil lake or river where they will not be disturbed and often return to the same spot two or more times during their fishing holiday. Fishing bait including maggots, casters, worm, frozen fish and ground bait can be ordered prior to your arrival and delivered to your accommodation. My sole aim is to give the visiting anglers a fishing experience of a life time. Take anglers to secluded locations that have been cleared of weed and pre-baited prior to the angler’s arrival either bank fishing or by boat. Dropped off by boat and collected at agreed time.